I decided to close this trade manually so I could cut my losses early. There were some technical signals confirming that I caught a bottom on this short USD/CAD trade, but the weak Canadian retail sales data was the final straw which pushed me to exit at market. It’s so weird how December retail sales slipped by 0.2% when everyone’s supposed to be enjoying a holiday spending spree! Core retail sales also came in worse than expected, logging in a 0.6% increase instead of the projected 0.7% rise. On top of that, the previous month’s figure was revised downwards. I guess that just means Canadian GDP growth for the fourth quarter of the year would most likely disappoint as well. Meanwhile, traders mostly ignored the 2.4% drop in the S&P home price index in the U.S., and focused instead on the three-year high CB consumer confidence figures. “Yipee!” for the U.S., “Boo!” for my trade. I should’ve set my entry point a bit lower than .9820. As I mentioned, breakout trades aren’t exactly my strong suit but I decided to give this a try. Now I know better and I’ll probably stay away from these types of setups! Still, I think I did a pretty okay job at staying on top of my fundamentals this time around, but I could’ve also done better at identifying a good entry point. I could’ve waited for the retest of the .9850 broken support level and shorted there. I would’ve wound up with a loss just the same, but it would’ve been much smaller. Also, I should’ve taken a hint when my entry at .9820 formed a range with the previous .9850 support. It bounced along the range like it was dancing to Chris Brown’s Yeah 3X, before it was once again supported by the .9850 handle. It wouldn’t hurt if I also checked different time frames in my next few trades. Just like LoboTrader pointed out, there’s a bullish divergence in the weekly chart that could’ve helped me adjust my position. All right, on to my next trade! Anybody spot a good comdoll setup? Hit me up on the comments box below. I hope I have better luck on my next trades! USD/CAD did break below .9850 as I predicted, but it looks like it’s now forming a new range. And, unfortunately, the bottom of the range is just where I got triggered! This is too bad for me because like Dev’s new single, I like my pips fast and my losses down low. Anyway, the good thing is that the .9850 former support area seems to have turned into a resistance, and I’m hoping that the rise in crude oil prices can keep the Loonie strong. After all, conflict in the Middle East seems to be growing worse now that Libya is following Egypt’s footsteps. This has already driven oil prices to its two-year high and, if the unrest spreads to other oil-producing countries, prices could keep rising and so will the black crack-related Loonie. In retrospect though, I probably should’ve been a little bit more patient and waited for the retest of the broken .9850 support. Another option would’ve been putting my entry order a bit lower than the significant .9820 figure. I could’ve watched the pair a bit longer, until I had more signals that the pair is heading south. Oh well, since my trade idea was based on rising oil prices and broken .9850 support, I think I’ll hang on to this trade a bit longer until we get hold of more reports. I’ll be on my toes for the big retail sales report from Canada today, as well as the CB consumer confidence and existing home sales reports from the U.S. If data from both economies invalidate my trade idea, then I might consider taking out a part of my position, or closing my trade entirely. What do you think? Should I hang on to this trade? My last USD/CAD trade didn’t go as well as I expected it to, but I’m prepared to give this pair another chance this week. It looks like the recent dive has been a pretty strong one… I mean, did you see that almost vertical drop on the chart?! Boy, does this pair know how to drop it like it’s hot! 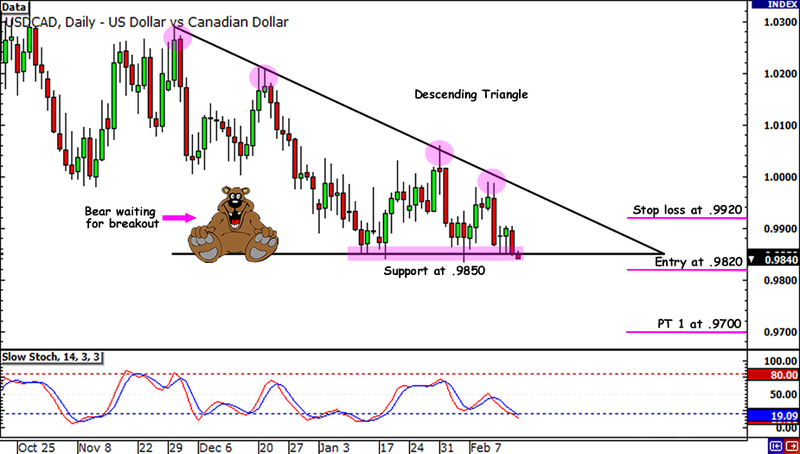 It seems that the pair is gearing up to make a break below the major support level at .9850. Although breakouts aren’t really my style, I’m gonna muster up enough courage to take this one. After all, the pair has been making lower highs and lower lows, which means Red Bull for the Loonie. Get it? RED candles on USD/CAD are BULLish for the Loonie? Okay, that was a bit corny, but can you blame me? I’ve been hanging out with Big Pippin a lot lately! Anyway, I took a quick glance at the economic schedule for the remaining days of the week and saw that both the U.S. and Canada have a bunch of red flags for today and tomorrow. Today, Canada is set to release its wholesale sales report, which is often considered a preview of its retail sales data. If the actual figure doesn’t disappoint and posts a 1.3% increase as expected, it could give the Loonie more reason to carry on with its rally. Then the U.S. will release its CPI report and, if inflation is subdued as Big Ben says, the actual figures aren’t likely to beat expectations. Anything weaker than the projected 0.1% uptick in core inflation and 0.3% increase in CPI could lead to more Greenback-selling. Later on, Bernanke could reiterate during his speech that inflation isn’t really a problem in the U.S. which means that the Fed wouldn’t be in a rush to hike rates. Tomorrow, it’ll be Canada’s turn to release its inflation reports. Both the headline and the core figures are expected to post stronger readings than the ones we saw in December. January’s headline inflation is estimated to land at 0.3% while core inflation could print a 0.2% reading. But with oil prices on a roll in the past month, I have a hunch that the CPI reports could beat expectations. In fact, oil prices are expected to keep rising in the near future. Ongoing tensions in the Middle East continue to provide support for crude oil, particularly when Israel’s foreign minister claimed that Iran was sending war ships to Syria through the Suez Canal. Although Egyptian authorities denied this claim, the tension among the oil-producing countries nearby was enough to spur panic-buying of oil. If you’ve been paying attention in the School of Pipsology, you’d know that USD/CAD usually drops when oil prices rise. I know oil isn’t exactly a girl’s best friend but, when it comes to this trade, I’m rooting for oil! Besides, who wouldn’t want to get in on the breakout scene on the daily chart? After popping up lower highs and testing the .9850 support many times, the pair looks like it’s about to disco towards south! To minimize my chances of catching a fakeout, I placed my short order below the previous low at .9820. 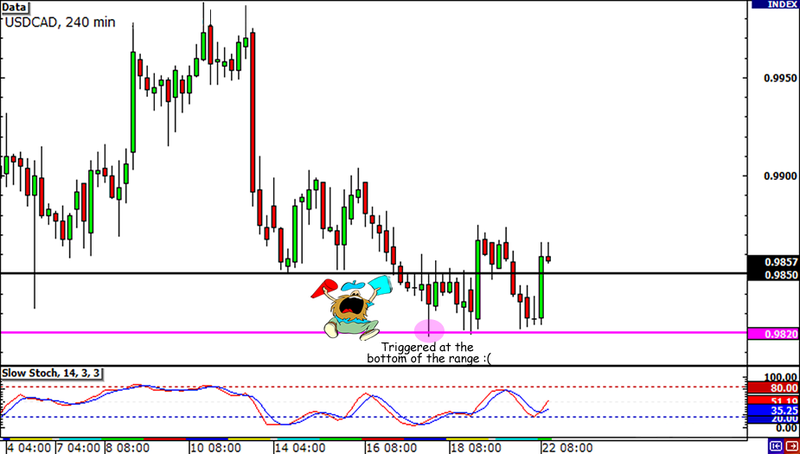 Then, I put my stop loss at .9920, which is above the day’s high and is 100 pips above my entry. Lastly, even though I plan on trailing my stop, I placed my first PT at .9700 so I can hopefully gain more pips than my last USD/CAD trade. As I mentioned in my previous entry, I’ll be more conscious of the upcoming reports and changes in market sentiment that could affect my trade. All right, that’s it for me today! I have to get ready for another girls’ movie night! Hmm, I wonder which one we should see first- Jennifer Aniston’s Just Go With It, or Channing Tatum’s The Eagle? By the way, I just signed up for a brand-spankin’-new Twitter account so I can update my friends with my thoughts on my trades, comdolls, or even food! Feel free to follow me or add me up on MeetPips.com!